Thank you Donna for this 68 mile 6,773ft route Strava route that takes out towards the Conwy Valley and back with lunch at Zip World. This route provided by Mark this week. The route can be found on Strava here. Collecting at Rhuddlan, and heading towards the S Bends before taking the 5 course to Llandyrnog. With the turn for Pentrecelyn then back via the fast road from Ruthin, Llanrhaeder and back. The course is 52 miles in length and 3,168ft of climbing. This weeks ride is bought to us by Sally. The route avoids Rhuddlan, and heads to Tremerchion, and down the West side of the range, then back via Caerwys after turning at Llandegla to head back. The main climb is around Graig Fechan. The route can be found on Strava here. “A swap in the ride rota means it is my turn to plan the route for this Sunday 29th Jan. Towards Ruthin, Pentrecelyn, Llanarmon yn Lal, Cilcain. Leave Saints at 9.30am. NO Rhuddlan collection.” — Sally Cunliffe (Membership Secretary). 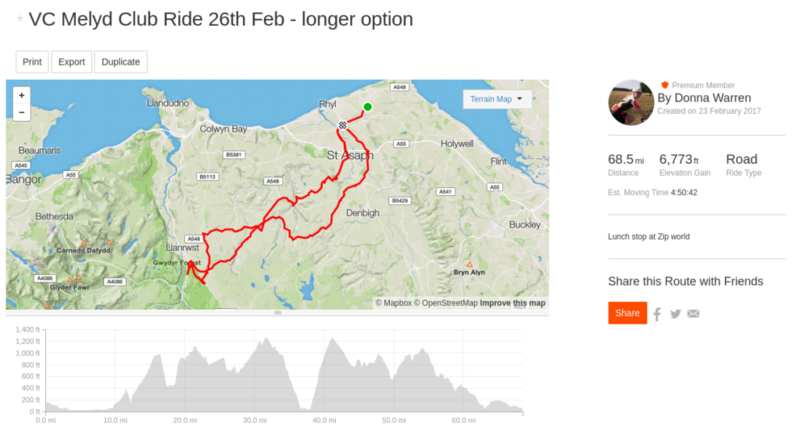 *This route was not ridden – and a flatter faster route to Conwy was chosen, before Sychnant Pass and back. This was due to ice at all heights. This route from Vic heads over to the Conwy Valley avoiding the Black Cat descent and heading to Bodnant for a cafe stop. Regretfully on the day the staff at Bodnant Garden Cafe were rude, so we headed down the road to the Welsh Food Centre, where we had a great time. Happy days. This route pushes its luck with the mixed group with pushing 1000ft climbing every 10 miles. Vic’s 50 mile strava route can be found here. 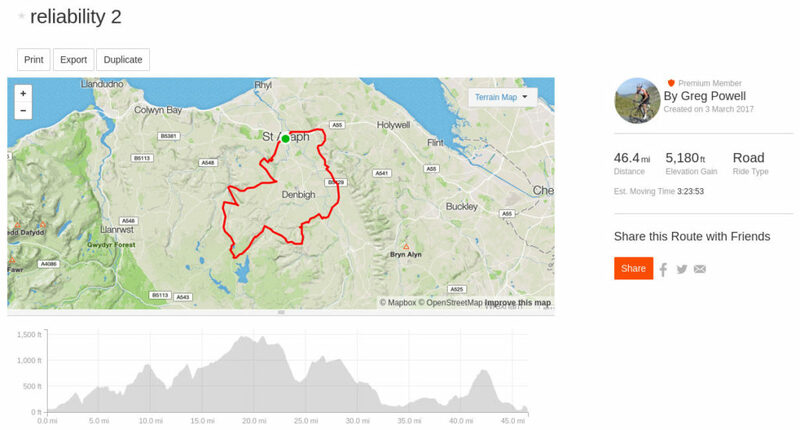 This route from Donna is out to the Denbigh Moors and back – taking in 54mile / 4,892ft of climbing. Icey weather caused us to avoid high routes – and we headed along the coast and back. This route will be a challenge for a combined group – seeing almost 1000ft of climbing for every 10 miles. Donna’s 54 mile strava route can be found here. Thank you Sally for this 57 mile / 3,917ft route over the Clwydians. Unfortunately spoilt by rain on the day, and we headed back below cloud into the Vale of Clwyd – where it had remained dry. 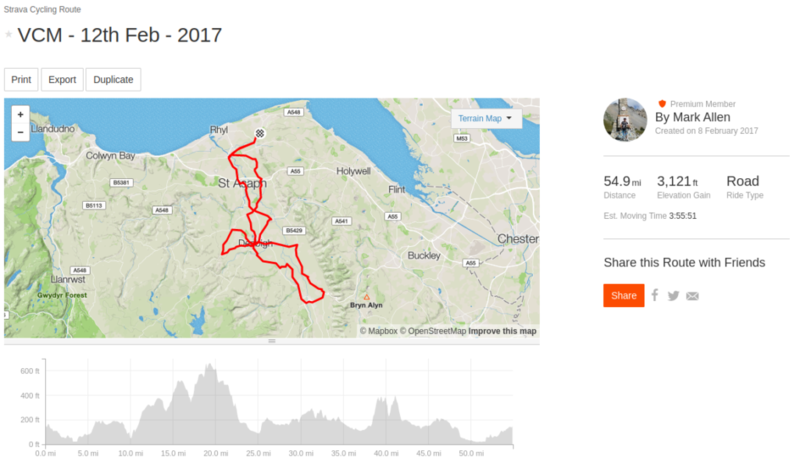 Sally’s 57 mile hilly Strava route can be found here..
A route offered up by Sally for this weekend given the frost that remained on the ground since last nights hard freeze. This can be found for review or download to your GPS device at Strava here. The route takes in around 51 miles (there is a repetition error at the end on Strava) and around 3500ft of climbing. Not going, or more importantly – staying – too high, and keeping on well used roads reducing the risk. Tomorrow looks warmer than today – and we look forward to seeing you out.